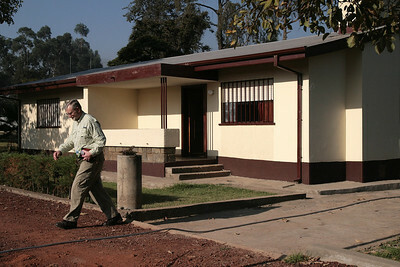 Keith Anderson takes a stroll across the mission compound. 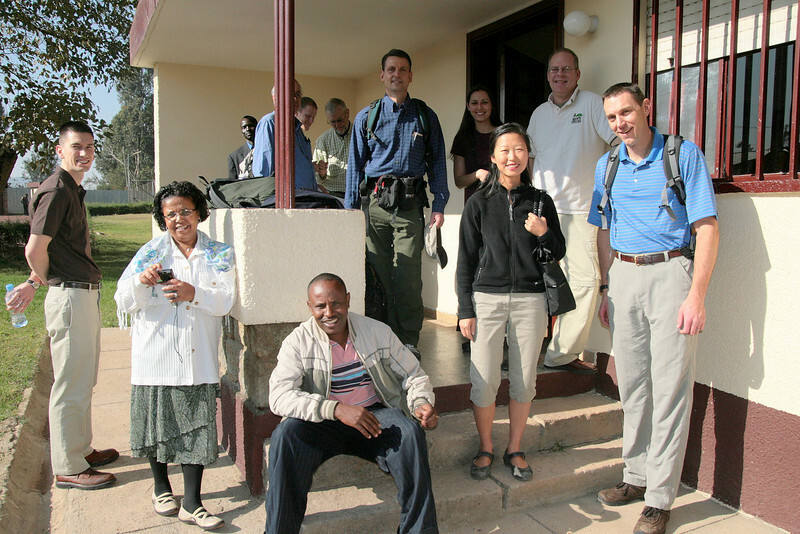 Some of the team gathered on the front steps.Counter clockwise from left: Robert Ivy, Alemnesh Heyi, Fikadu Heyi, Susan Lim, Mike Meyer, Brad Nelson, Christy Ivy, Paul Wallin. 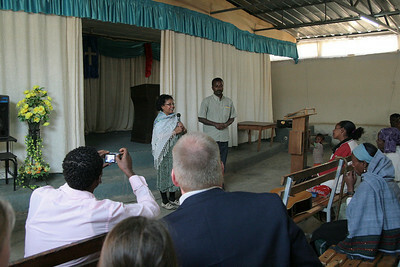 Alemnesh Heyi delivers greetings to the Mekanisa Addis Kidan Baptist Church (MAKBC). 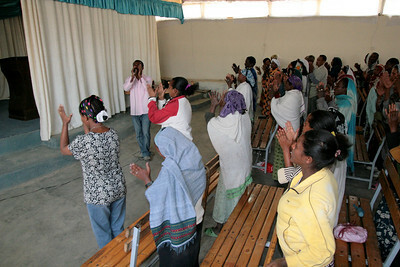 Worship at Mekanisa Addis Kidan Baptist Church (MAKBC). 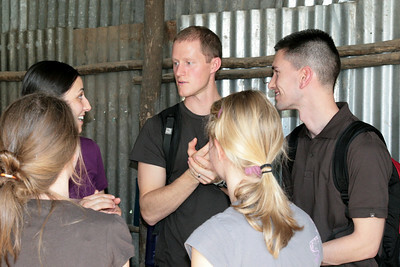 Team members visit together (Christy Ivy, Clint McAlpine, Robert Ivy, Emma Button, Jenna Wyman). 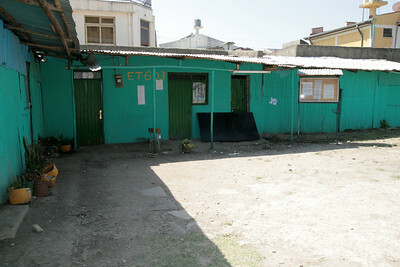 The educational and community services compound of MAKBC. 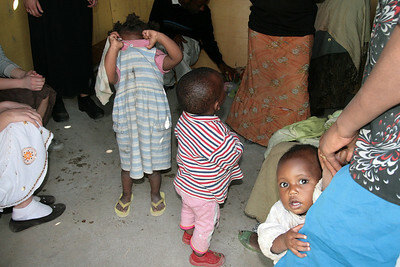 Christy Ivy shares tender moments with little ones from the neighborhood. Blowing bubbles - an acquired skill! 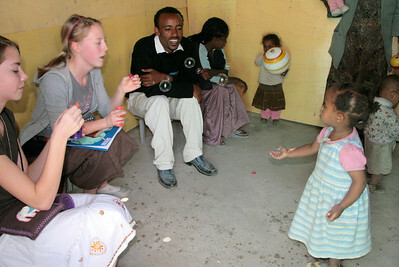 Jenna W. and Emma B. blow bubbles to the little ones. 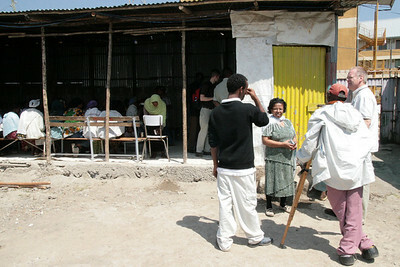 We prepare to receive the "poorest of the poor" for a meal served by the American team. Note the loud speaker and Islamic moon and star atop the tower in the background. 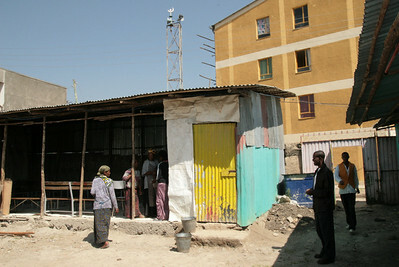 Some time ago, a Mosque was built directly across from the MAKBC church. Clearly, the intention was to overcome the evangelical presence on the block. 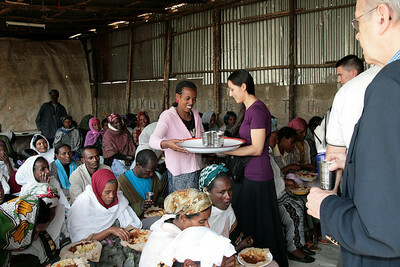 Thus far, that effort has not succeeded, and instead the MAKBC church is having a positive impact on the mosque and its attenders. 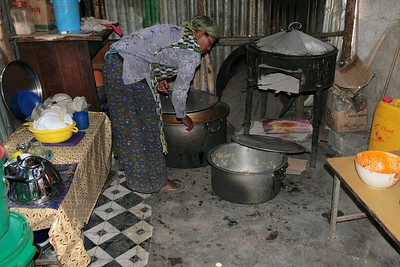 The large covered stove in the background is for cooking injera (an Ethiopian flat bread that is used to serve food on and to pick up for eating - because you eat with your hands!). 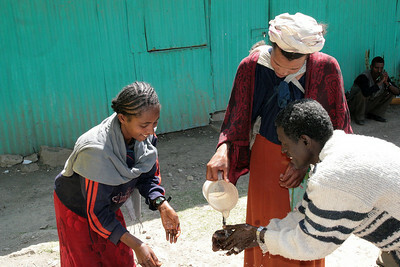 Before eating it is customary to wash hands, because in Ethiopia you eat with your hands! 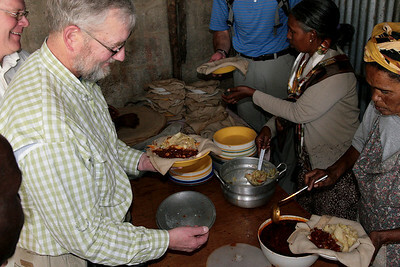 First the injera bread, next the cabbage dish, then the spicy chicken stew. 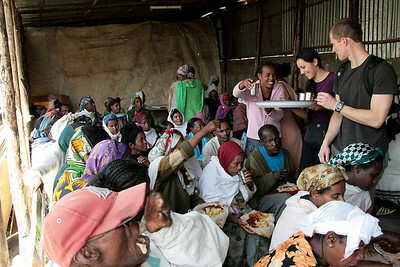 Here you can see foods portioned out on top of injera bread. 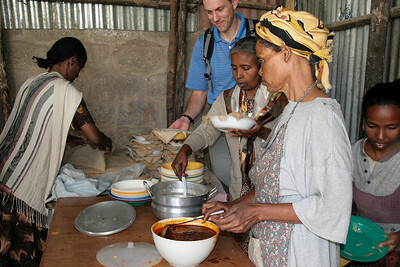 You tear off a piece of injera and use it to pick up the prepared foods. 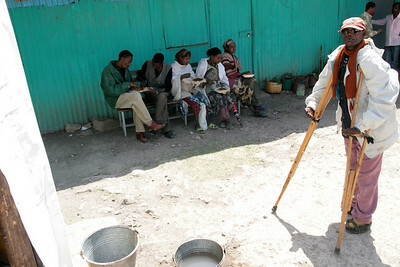 This dear gentleman (left) suffers from leprosy, a disease that is still all too common in Africa. 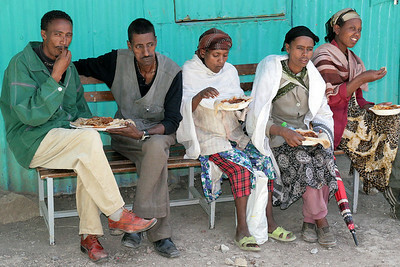 Some friends share their meals together on a bench. 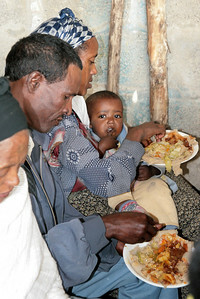 Note how the two men are sharing a plate in friendship. 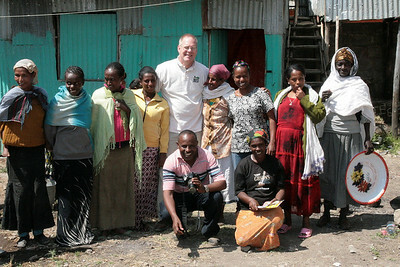 American team mission leader, Brad Nelson, gets a photo with some of the meal participants. Fikadu Heyi becomes a photographer in this shot! 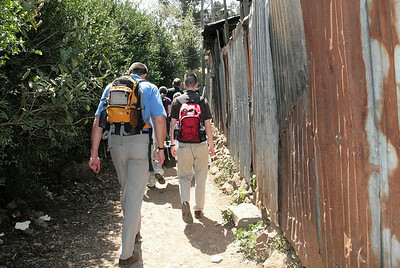 The American team takes a walk through an alley way to visit team member Alemnesh's home in Ethiopia. 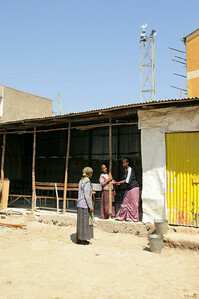 The tin fencing is a common means of separation between properties. 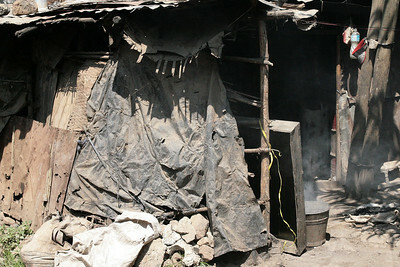 On the way to Alemnesh's house we pass a poor person's home. This one is not holding together by much. 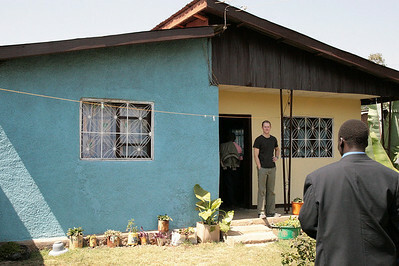 Alemnesh's house. 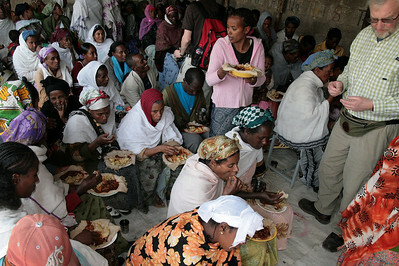 Alemnesh has dual citizenship and lives in America. 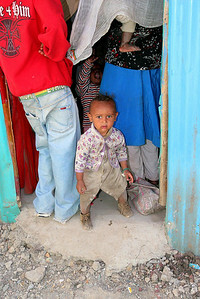 But she lets out her house in Ethiopia to the MAKBC church to use as they see fit. 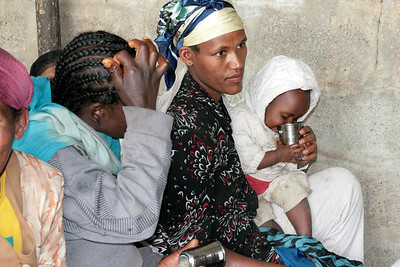 Here is out own Alemnesh with one of her daughters. 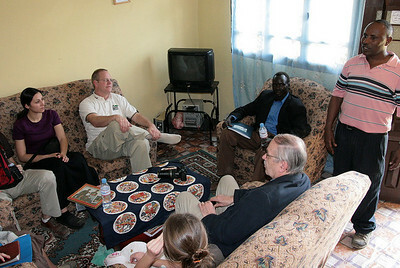 The team enjoys bunna (coffee) in Alemnesh's living room. 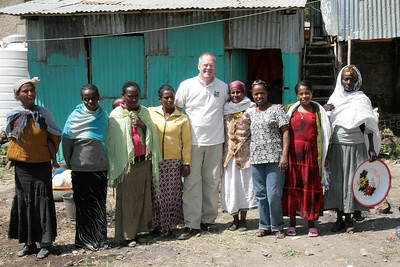 The MAKBC church often uses her house for small group gatherings and leadership training. 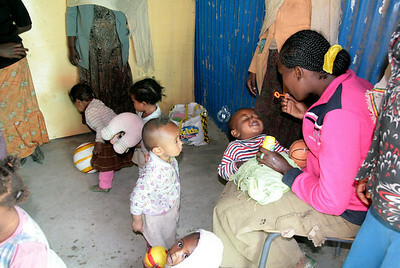 We also stopped by the local Addis Ababa zoo. 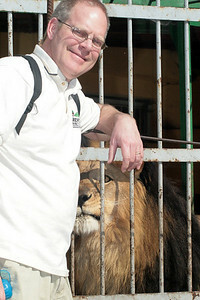 Here, Brad poses for a picture, and the lion sizes up a potential meal (Actually, the lion tried to take a swipe at him right after this shot, so Brad decided to put some distance between himself and the king of the beasts). 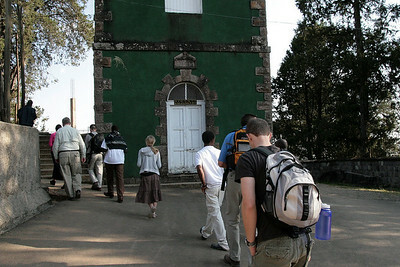 An orthodox church at the top of mount Entoto. 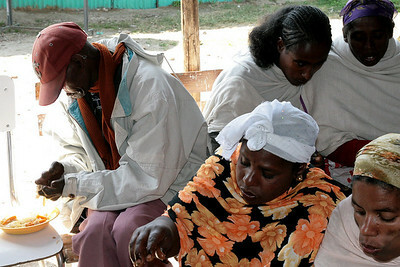 Mount Entoto is the highest peak overlooking the city of Addis Ababa, the capital of Ethiopia. 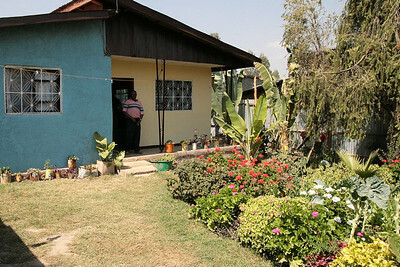 Mount Entoto is part of the Entoto mountain chain, reaching 3,200 meters above sea level. 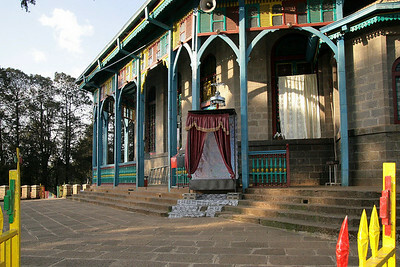 It is also a historical place where Menelik II resided and built his palace, when he came from Ankober and founded Addis Ababa. 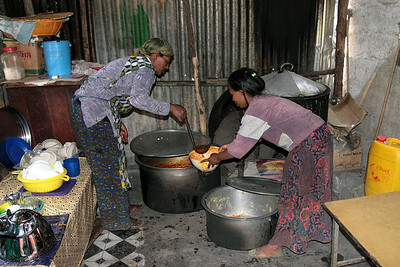 It is considered a sacred location and holds many monasteries. 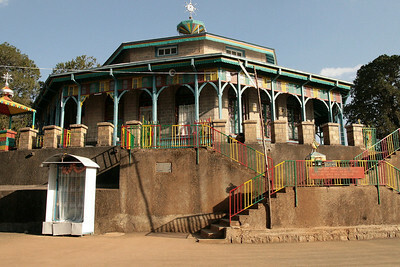 Articles of historical significance that were donated by members of the royal family, foreign diplomats and individuals are well displayed in the Entoto Museum. Architectural design and the inner wall paintings of the church are fascinating. 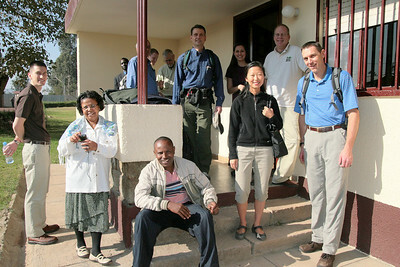 The American team takes a tour of the Entoto museum. 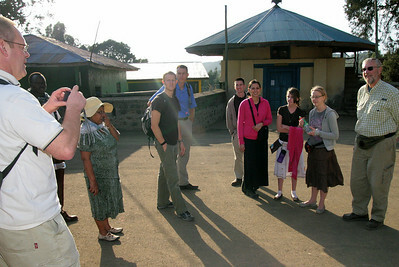 Some of the team gathered on the front steps. 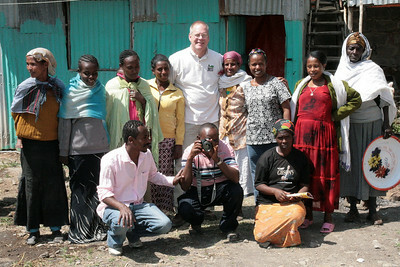 Counter clockwise from left: Robert Ivy, Alemnesh Heyi, Fikadu Heyi, Susan Lim, Mike Meyer, Brad Nelson, Christy Ivy, Paul Wallin.